The Bike Is Behaving Strangely Today Rod's Inazuma 250 has been just fine but today it is acting in a most peculiar manner. 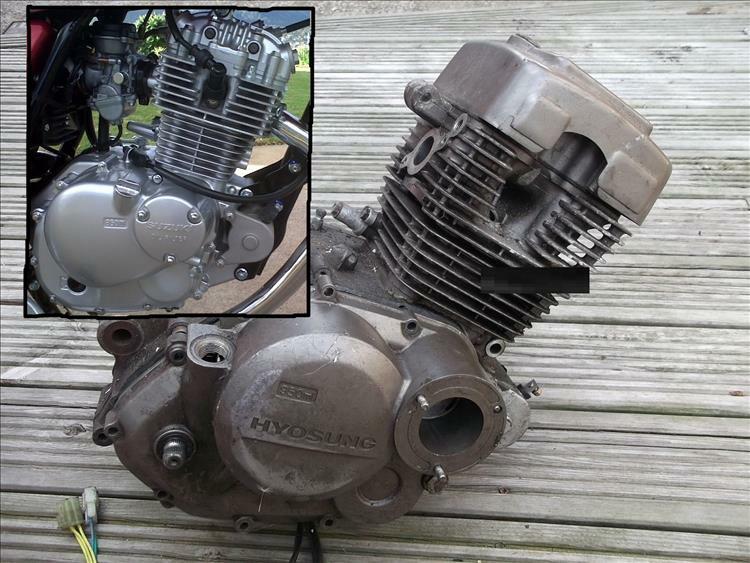 Can you help Rod diagnose the issue he's having with his motorcycle? MPG - The Bike Or The Rider? Motorcycles use fuel. But what governs that consumption most, the rider's style or the design of the vehicle? Rod has got his thinking hat on. Bikes And Walking PocketPete asks a very important question. 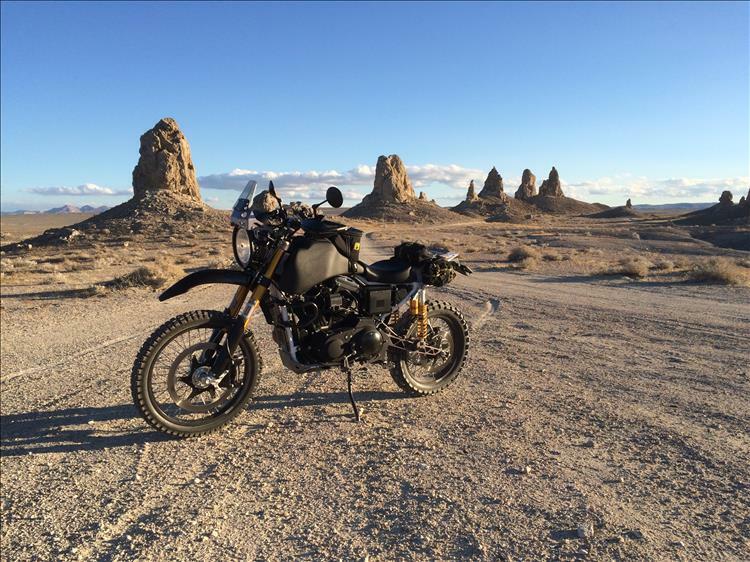 Can you ride a motorcycle then go for a hike? It is rather spoiling his days out. Report - Stafford Classic Mechanics Show Nigel is made to reluctantly enjoy himself again by looking at old motorcycles. It's a dirty job but I guess someone has to do it. Time For New Tyres Latchy's been busy fitting new rubber to the Striple. It's a dirty job but someone's got to do it. Awwww bless. Honda In A River Bill has a cautionary tale regarding crossing fords. Fishing for motorcycles anyone? My CRF230 Story So why would Bill want a CRF230 and what has he done to it to get it to be the bike he wants it to be? Serious rear brakin' folks. Schuberth C3 Pro Helmet - The Saga Continues PocketPete's having a nightmare sorting out his Schuberth helmet. There's a bit of a teardown guide too. Kawasaki ER-6f First Ride Bill's picked up his nearly new Kawasaki ER-6f. How did he come by the bike and what are his first impressions? Sunday Football Game Fran's leading his daughter on a merry ride around the outskirts of Auckland. OK having checked with Ren here are a couple of links that people might like to check out. 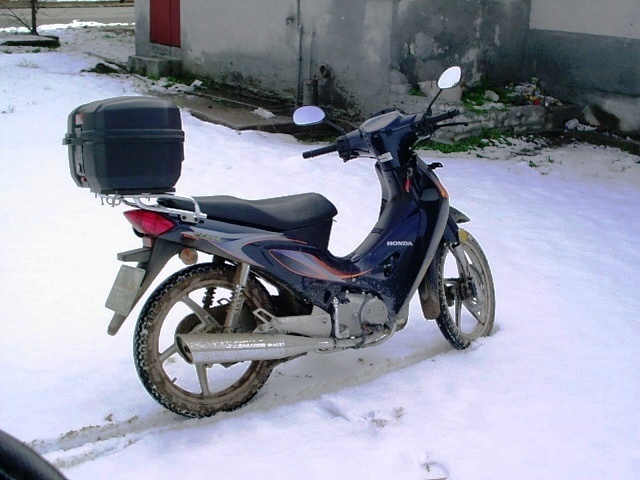 The wonders of 125cc touring!! Cheers Tony! And Henrik, yes I was looking at the TX yesterday. 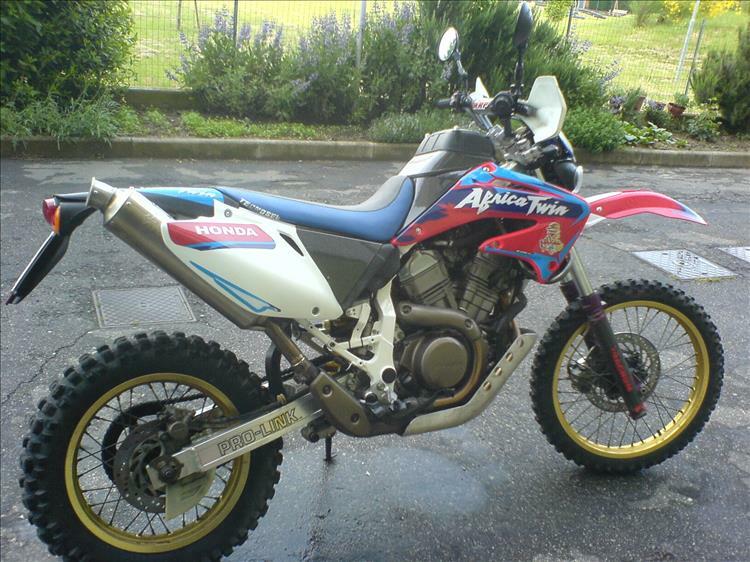 We have it in both motard and trail style. Hmmmm, tempting. But when you see these lads in the links having fun and adventures on their almost cruiser type bikes it really doesn't matter what you ride, just get out there! Hi Henrik. I reckon the RKS is perhaps too small for yourself. The TX would be the better bike overall. The engine and I'm guessing many other components are the same between the TX and the RKS anyhow. So you're sorting out your soon to be marital home! It's all a part of life's adventure, hope it all comes together for you both. Wow! When you said house build I thought you meant a bit of paint, put a shelf up and so on, not a proper rebuild! That Innova is actually a truck isn't it. Oooh that's rather nice. Trouble is we don't get the 200 or the 250 here in the uk. Sharon would love this if they brought it here. Ohhh if only it was available in the UK. I would buy it. Ren is right about me for once :-) I love it. Actually I like the old model better ,..
1. Adjust/modify the suspension upwords, both front and rear, evt a "riser"
5. Make a seat-pillow for longer trips, (evt fastened with Velcro),..
Henrik - the RKS is a small bike. Of course you can alter it to make it suitable for the bigger rider but is it worth it? Just spend a few more pennies and get the TX which you've mentioned and is already a larger bike. I think you just like to play with things don't you. TX's not just a few pennies over RKS, (and they just rised the TX prices). in spain still, (and btw removed from the new Keeway site also). I have been in Contact with the Danish import today, and they won't help. Anyway not in a hurry either, usually I bye my MC's with a few miles on the clock anyway, they just started to sell them, so in fall maybe. 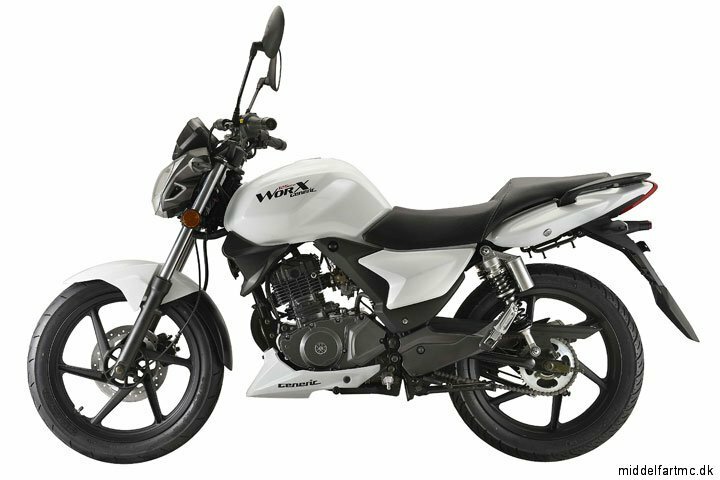 A modified RKS would be, in case, an additional small-trip bike, to supply an KLE 500.
arrived, and looked very nice, a good alternative to Honda Innova I guess,..
Henrik - it is frustrating when the company no longer supply the model you're after...grrr! 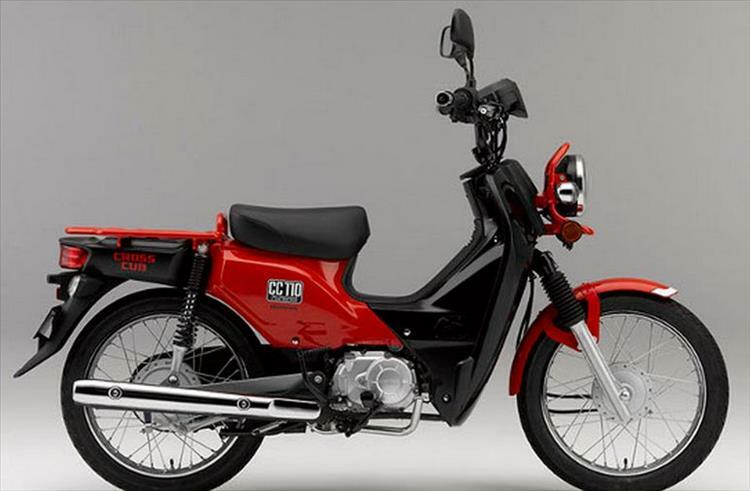 Honda no longer have the inimitable C90 on their books and they don't want to bring in the funky looking Cross Cub. Oh my I'd love them to bring that machine to the UK! The Suzuki is a great bike, the only downside is the weight. As for the price yeah it's more expensive than the unfaired base model but it's still a good price. Wow, that cross-cub is funky indeed, and very interesting !!! 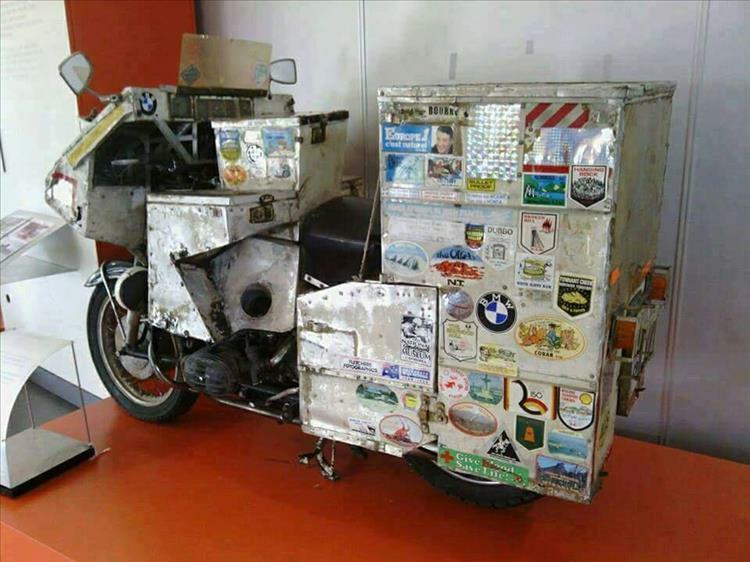 bike with some unique luggage-solutions, in front as well,.. 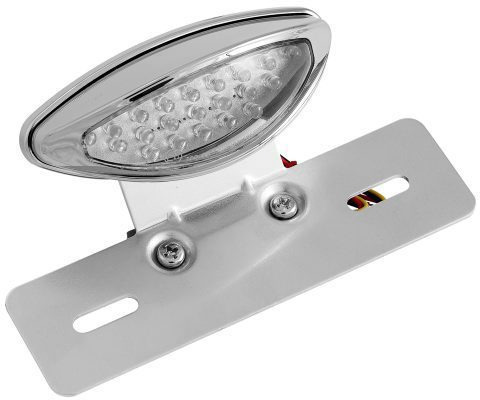 Looking around the internet I can't find anyone who's selling these in Europe so far. There's talk of some guy actually starting an import business but that seems a long way off yet. Damn you Honda! Hyosung, how are they ? and how about availability and prices on spareparts ? Hi Henrik. Can't say as I know much about the Hyosung - except that somehow, someway, they seem to be connected to Suzuki...? Looks smart Henrik. 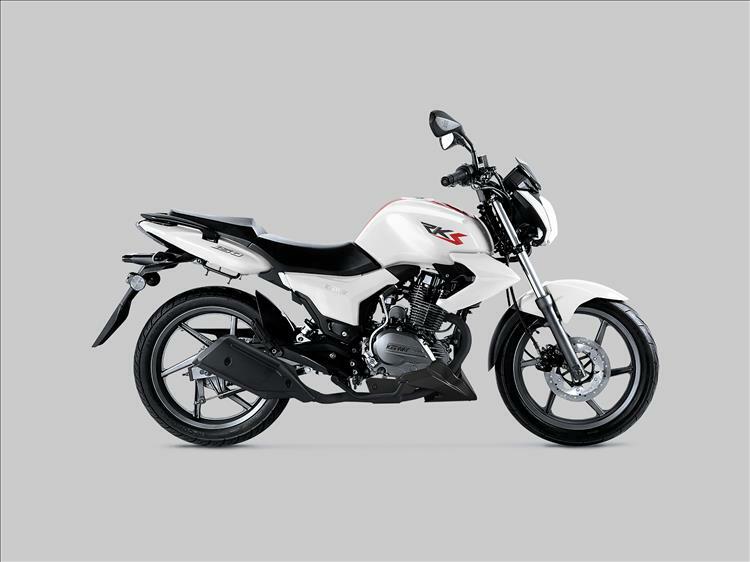 Do you know if the engine is based on the Suzuki GN engine like most of the Chinese bikes? It's cut with the same knife, somehow, but as usual there is diffrencies, to the degree that I don't thing one single part will be directly compatible !! 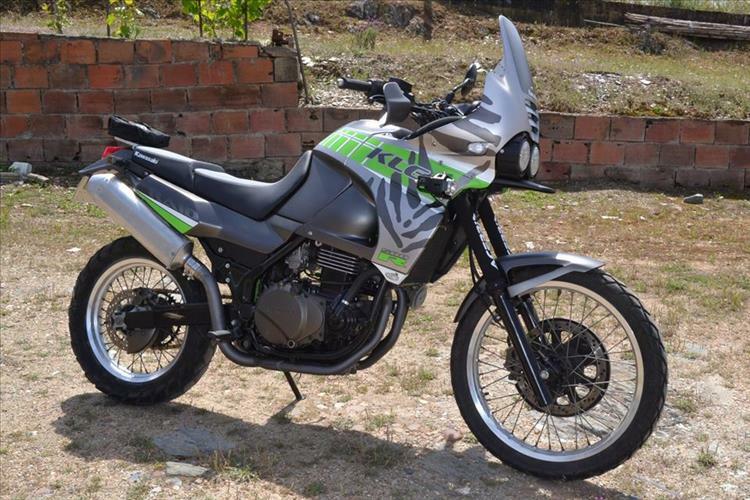 I think that DR 125 should be the basis, but maybe its the same as GN 125 ? Oh it all gets very complicated! Sharon's Keeway is ALMOST the same as the Pulse engines for example but we know they are not actually the same. 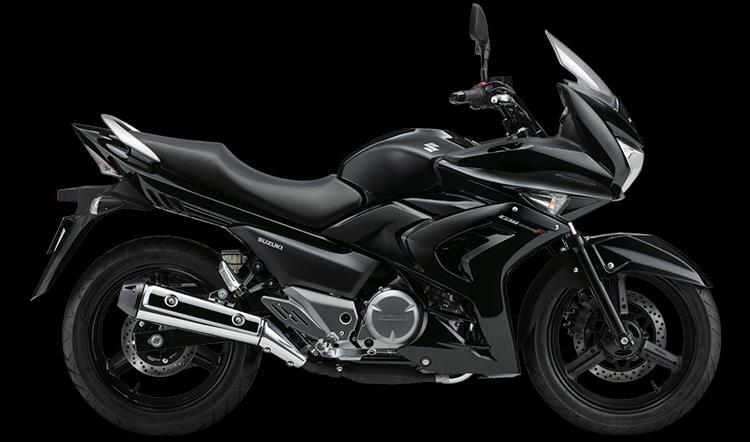 I've had another look at the Keeway TX...tempting. 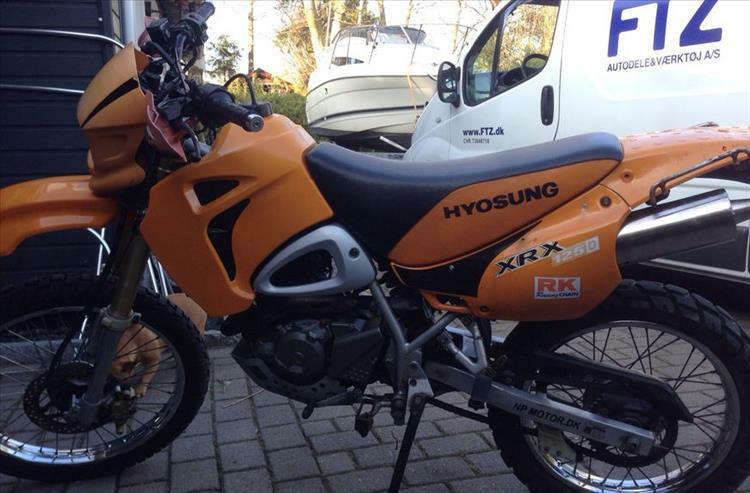 About clones, we got this "Generic Worx 125" in DK, identical to the Keeway RKS, the price is around 1600 GBP where the RKS is onlu around 1000 GBP. But then again, the cheap RKS is also the one with complete set of spareparts at stock locally always LOL :-) guess it takes a IQ below 70 to jump on the Generic-version, unbelievable, but true,..
Got it, on the wet-weight I stand a bit corrected, the 2008 XRX is 128 kg, where the TX is 147 !!!! so the span is actually 19 Kg and not 15 Kg. Then comes a moderate reduction where XRX is more fit for modifications I guess. one from ebay, korea, is hitting me in two weeks, to be cut out nearby,..
Woohoo! New bike! I shall of course be expecting a full and comprehensive review in my email a month or so after your first ride. And updates. Glad to hear you've finally sorted it all out. Are there any trips planned? perfect weekend, what a toy,..
Glad you're enjoying the bike Henrik. Now look after it, I might want a go if I sort oit a trip to your place. Now stop making me jealous. Thanks, weight matters, in case you want to use several feets to double-feed a fancy solution like this KTM ;-) KLE standard system is extremely heavy, so on a old bike project, where the system is often renewed anyway, why not shot two flyes on one shot. (just research). 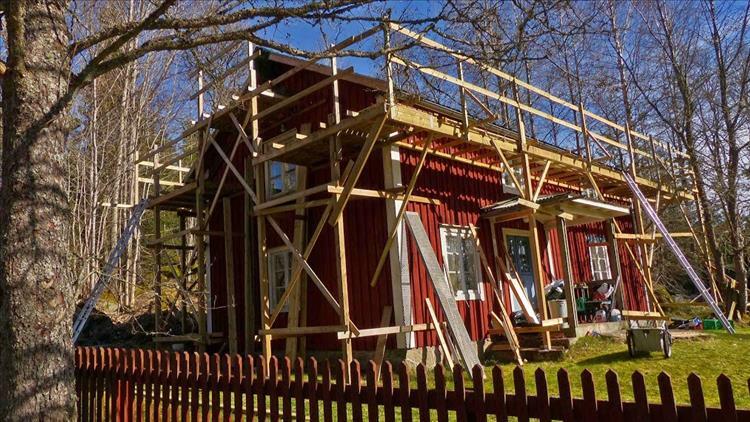 Henrik - I think you just like to tinker with your bikes when you should be getting on with the work of finishing your house! Cheers Henrik. That's an excellent article and it is good to read that not all overlanders are filled with confidence, bravado and heroism. This guy just did what he could and got out there and did it. Inspiring. Ooooof! Sweet bike. Looking at the pictures from the link I wonder how much he spent? There's a lot of work gone into that machine. I wonder if you'll do the same for yours Henrik? I understand Henrik. You're a busy chap with a lot going on and a lot more plans beside. I personally even if I had the time and the money would not be able to produce high quality work like that bike. I'm a bodger, a fixer-upper and a hack. I'm no good at pretty and nice or finesse. 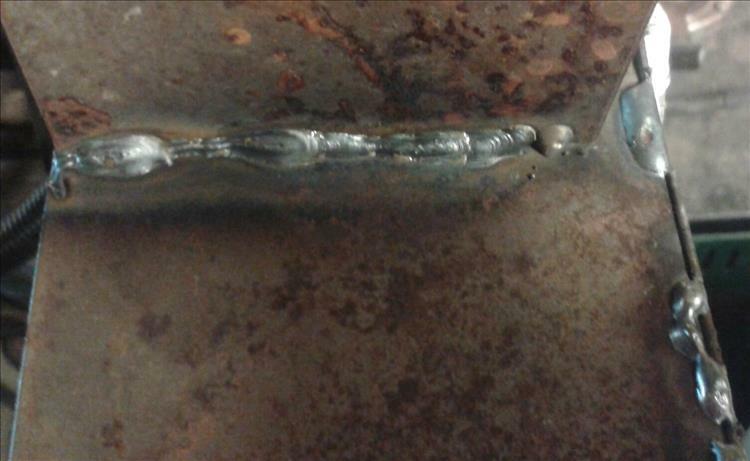 To be honest I'd rather be riding than spending an age making something look pretty. to each his own though, I know a lot of bikers love crafting and creating, perhaps even more so than riding. I'f I'd created a beautiful motorcycle I'd be scared to ride it in case I smashed it up. 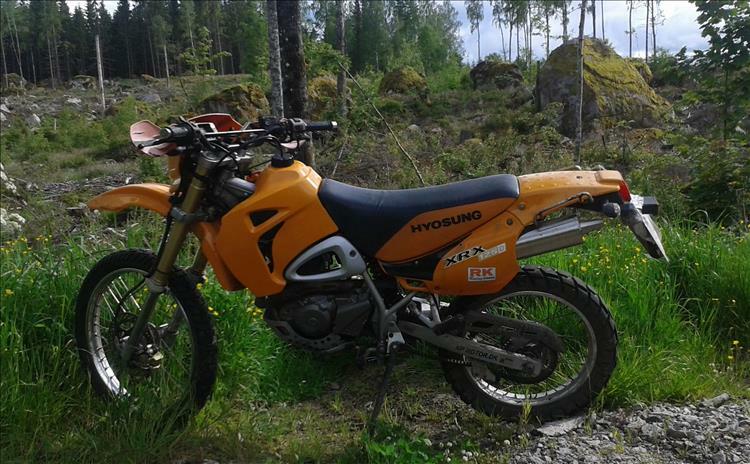 A nice very hot sunny Saterday on my Honda Flush WH125-6. 387 kilometers. Hi Peet. You're as bad as Henrik for posting up pictures to make me all jealous! That is one long straight and empty road right there. Where is it? 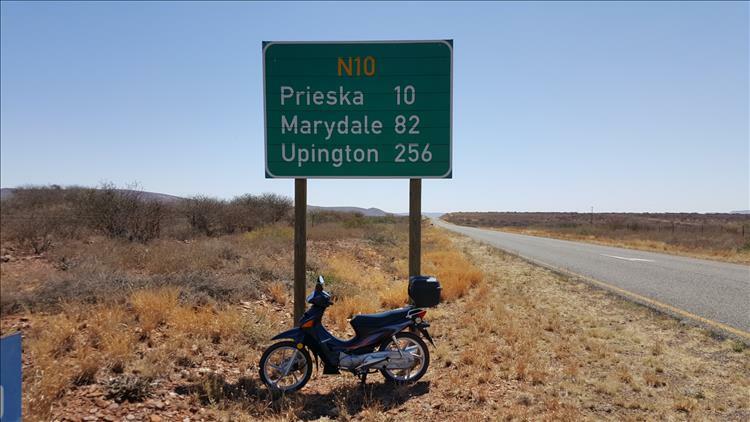 It is between Prieska and Britstown, Northern Cape, South Africa. Here is a link on google maps that indicate the trip route that I did on Saterday. You will find between Prieska and Britstown on Prieska's side two thirds of the distance (almost 90 kilometers or 56 miles) only makes about one small bent if you look at the map. I forget how big Africa is, just looking at that map your big trip is just a short hop inside Africa. The sense of scale is all lost when you live on an Island like the UK. 2 questions, is it always dry and are there plenty of fuel stations for the dinky tank in the Flush? The Northern Cape is almost like semi desert so yes most of the time it is quite dry. The average rainfall is in the region of 200mm per year with temperatures ranging from -17 to 50 degrees celcius. When it rains it is usely heavy showers. 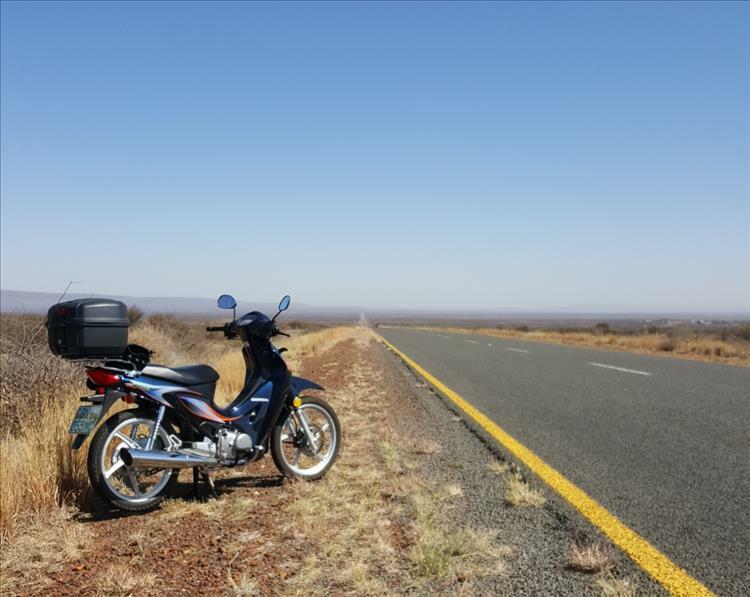 On a normal day I can do 120 miles on a tank of 3 liters putting all places within the boarders of South Africa within reach without running out of fuel. On Saterday I filled up in Prieska on my way back and drove 116.25 miles to get home and then the tank took 2.23 liters of fuel to be filled. 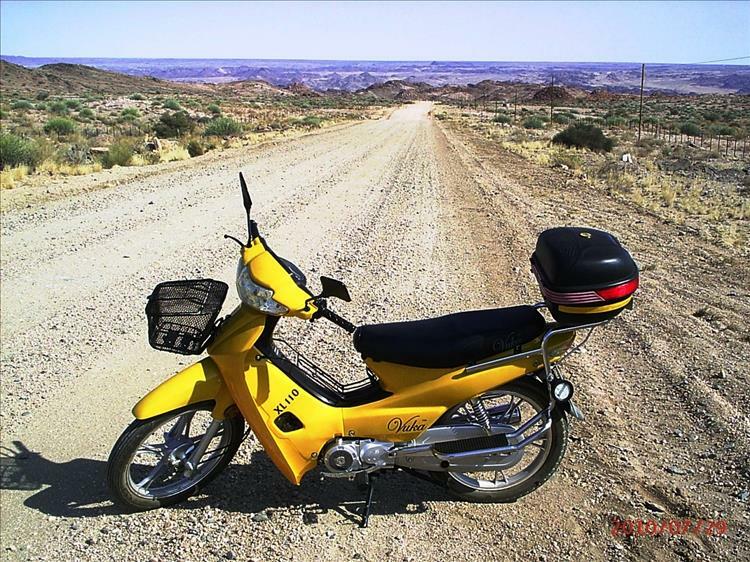 Some long ago traveling with my X Honda anf look a-like, Chinese Vuka XL 110, to some remote border crossing village on the border of South Africa and Namibia, Onseepkans. Hey Peet. I do love a dusty long gravel track. There's a road like that near here on the way to Southport. Ours is about 2 miles long, that looks like it could go on forever. As it's cold, wet and thoroughly miserable here right now your picture makes me wish I was somewhere warm, dry and dusty. I bet you're wishing you were somewhere cooler? Next time include a picture of yourself, it'd be great to put a face to the name. HENRIK!! What are you trying to do - traumatise us? That was funny but it was also awful. And believe me if we let Sharon sing on a video people would be running away in their thousands. Cheers for that Henrik, you made me laugh. 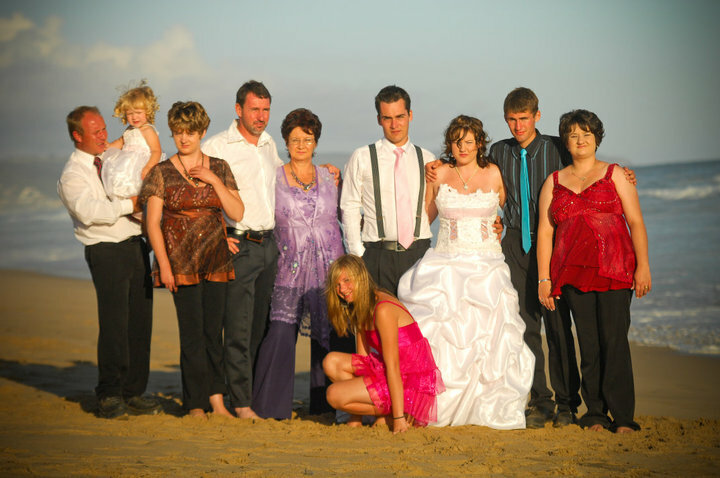 Here I am with my wife, 4 daughters, 1 son, 2 son inlaws and one grandaughter, hope this help. 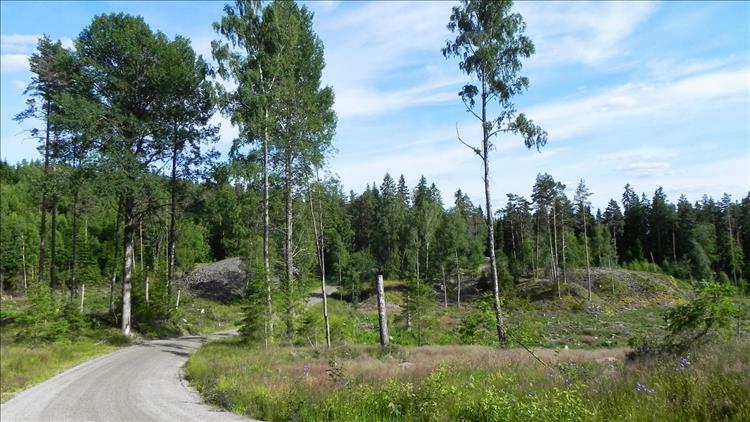 That gravel road with the yellow bike is 65 miles, I once did a 65 mile gravel road trip with my Honda in the snow and rain and mud and hope this is not what you have to experience in the UK for it was not at all what I'm used to. 65 miles...of gravel...Sheez, England is so small... I never thought you'd get snow though, are you high up? As for you and the family it's great to put a face to the name and to see your clan. You've gotten your hands full there! Thanks Peet. "Met Sharon in een luchtballon"
When removing a spark-plug from a very deep and almost "hidden" position, how do you best make sure that no dirt will fall down into the cylinder ? The only way I know of is to use an airline to blow any loose stuff away before starting the job. Not perfect though. You can always pop along to your local tyre emporium. You'll never get right down beside a tight fitting plug cap with a toothbrush. Apart from which the paraffin makes your teeth go a funny colour. Oh very funny Ian...please...no more. I can't take any more. Here is the highest pass I had to cross so far and where it snow almost every year, about 120 miles from where I stay but a totally different scenery. Almost 6,000 feet! Bet that makes your ears pop. It looks lovely...now go up in winter when it's covered in snow. Excellent shot Pete. 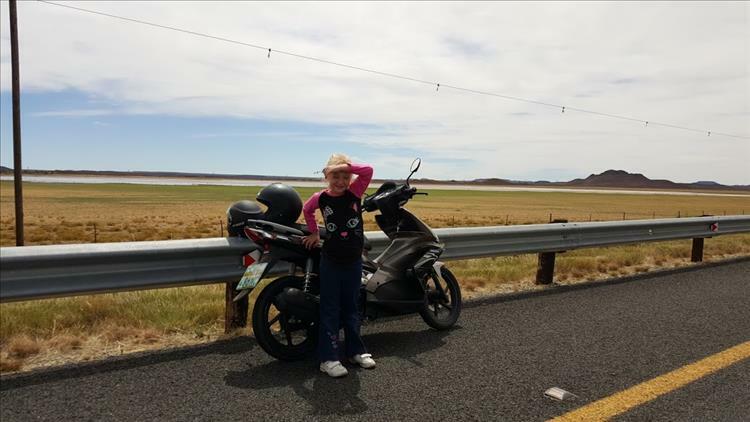 Me and my granddaughter taking an 80 kilometer drive on my daughters Airblade. Hi Peet. 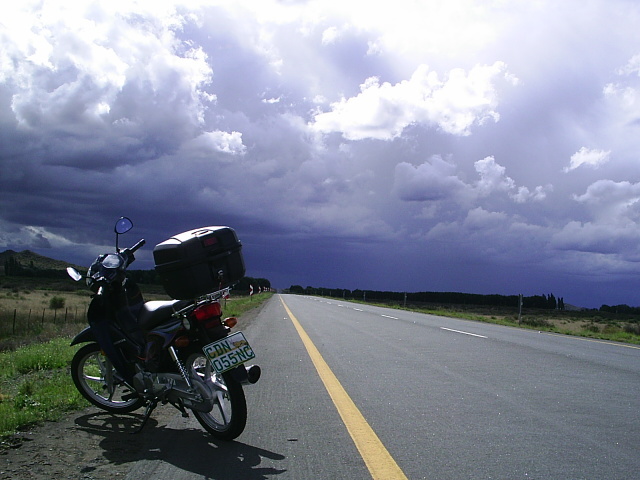 Is it always sunny in South Africa? And who was driving, you or your granddaughter? Not always sunny but mostly sunny. Though she was sitting infront I was still doing the driving! Here is a photo taken just the following day of our little town while hiking with my granddaughter, it shows just how sunny it gets, not a cloud in site. It's hard to imagine such a lovely day in this grey and wet weather we're enduring here in the UK right now. That said this Sunday was clear and bright if a little windy. 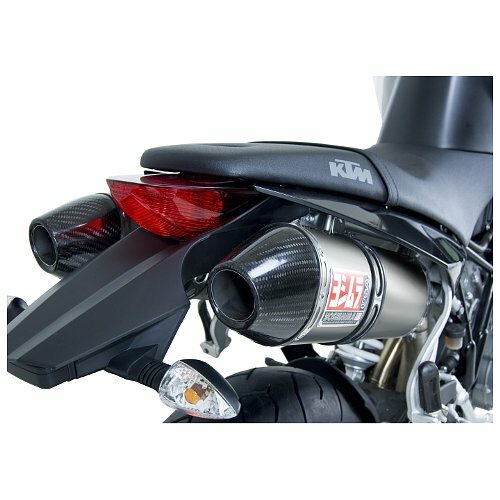 What is the highest miles that someone has put on a 125cc or smaller bike, step-thru or scooter that anyone know off? I've seen a video of a Peugeot Speedfight 100cc that is on 100 000 miles and the owner is aiming for 160 000 miles. Here's me getting all smug about 48,000 miles on the CBF 125 and some dude in Germany has put double that onto a goddam French scooter! I am an amateur I tell ya. I think this might become a post on the blog somewhere Peet - "Show Us Ya Miles". That sounds like a great idea and I recken it will inspire many or atleast me to put some high mileage on a small engine!!! 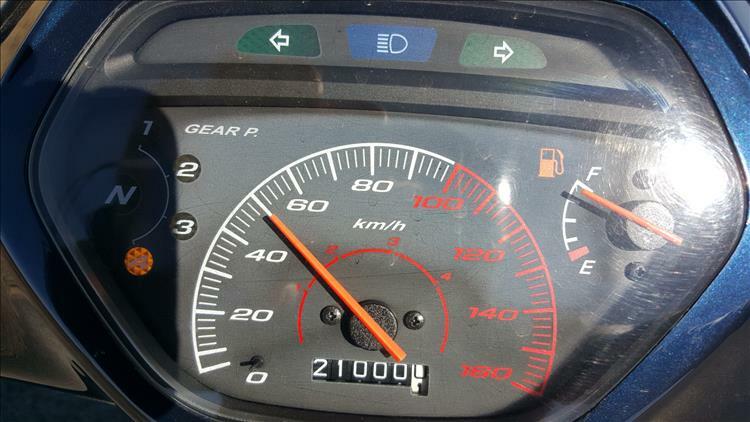 I only managed to do 13 000 miles in 4 years but that little Peugeot inspired me not only to play catch-up but to see if I can't pass his aim of 125 000 miles. 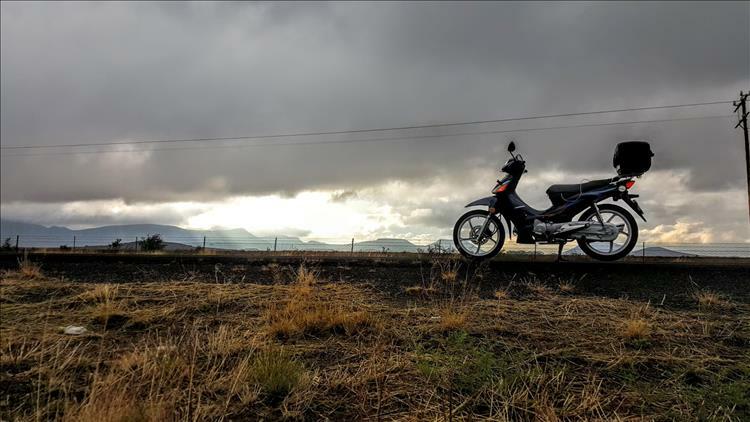 On 48 000 miles you are, just like the Peugeot and its owner, a legend in my eyes and I wonder if there is maybe someone that has done more on a 125cc or smaller. Legend! In my own time too huh? Hardly, I'm just too tight to use a car that's all. Do remember it is not actually a competition nor does riding big miles make you a big man. There's no point doing it if you ain't enjoying it. The guy on the Peugeot seems t be having fun though. I truly enjoy riding my little step-thru but to be honest if I only use it to get from A to B I would struggle to do more than 600 miles per year. Then also if it was only about adding miles I would rather get something that can cover some miles for where I live a proper bike can easily cover 250 miles in two hours and to drive flat out the whole time with my 125cc also just to have the trip counter ticking over faster will not give me an average of 173 miles to the gallon and will still only amount to about 100 miles in two hours. So I would like to see my bike and I do some serious high mileage while still breaking economy records for it gives me great pleasure doing it and looking at it financially it gives a poor man the privilege of seeing the world on a very limited budget. So I work, pay the bills and then hunt down the miles as often as I can but looking at my mileage it is obvious either the income is too low or the bills too high or the opportunities not nearly as many as I would like them to be, but I often find myself scheming how to put more miles on my 125cc and 600 000 miles often comes to mind while scheming. 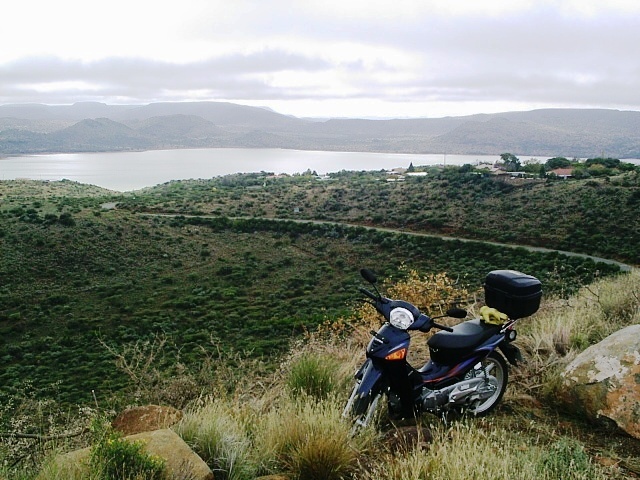 Then maybe if I rode more and schemed less my little 125cc would be able to show its potential and capabilities even more and transport me to more interesting and beautiful places. So I'm a high mileage, low budget, economy type of person seeing very little need to use 1.2 ton of machinery to move 0.1 ton of flesh but if it was only about things making sense I could just stay home and be satisfied with the adventure to be had from watching Discovery channel, so there must be some value to be harvested while crawling along on a 125cc and this is a very difficult thing to explain and can only be fully understood by those doing it. 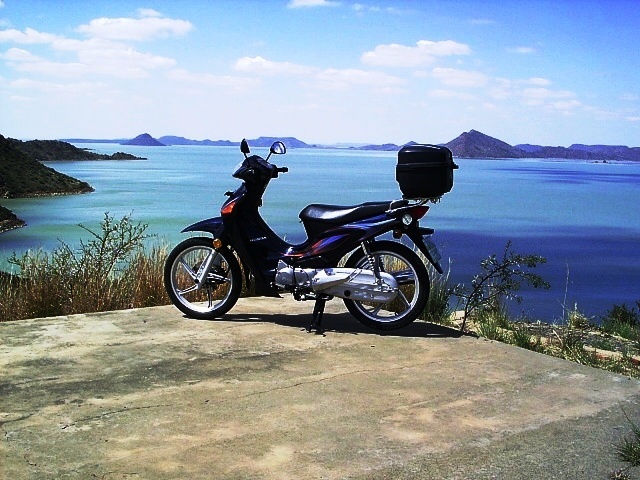 A 125cc possess the power to take away many a lame excuse for having one's own adventure. So every time I'm blessed with the opportunity to take a drive I'm having an adventure while gathering some memories for when I can drive no more. Hey Peet. We're singing from the same song sheet you and I. Yes...yes if I were a rich man I'd have a big fancy super touring off road thing but I'm too lazy to be rich. I prefer enjoying my days not working too hard and being a mean miser with my pennies. There is also a satisfaction to be had by racking up the miles on a small bike. 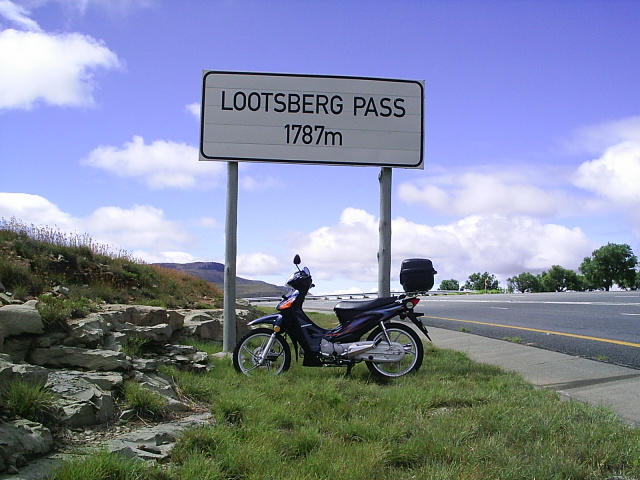 There's more of a challenge in taking a sub 200cc machine to far off places as it can be too easy on a big bike. To go a long way on a plane is easy, to go a long way on foot is an achievement. I've added a big miles page. I hope that inspires you to get out there and see more of your country. I keep on hearing just how beautiful the place is. 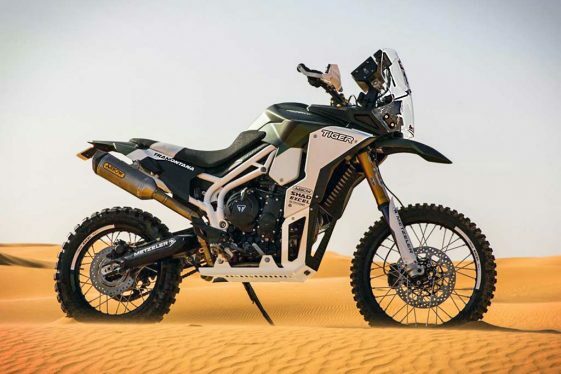 Harley never appealed to me at all, all though I love their engines,..
Now I came across this Carducci Dual-Sport ,.. WHAT a beauty !!! Wow! A harley engined BIG trailie, now there's a thing. I once came across an "adventure" 883 in the flesh which was a standard bike with jacked suspension and knobbly tyres, that's all. The owner was totally mad and claimed off road it was "acceptable". It seems a shame this bike isn't in production. I reckon they's sell even if they cost over £20,000, because the top line production BMW's are close to that now. Good find Henrik. The Buell Ulysses was an attempt in that direction although I don't think it had a huge following. Came across this delightfull talk from a wonderfull english lady on small bike travel and truly enjoyed it a lot. I guess you guys have heard about her and her adventures but I share anyways. Another trailie Harley, although the Buell looks a little less serious than the Carducci. I bet they are both phenomenally expensive though. Cheers Ian. Peet - that's an inspiring video and despite her claims she's a far braver lady than I. I'm connected to Lois via facebook and she is something of a character and legend in her own way. I am still at the stage she was when she first set out, over prepared and scared of letting go. I wonder if I could ever grow like she has. Every now and then a African Twin project pops up, not the same, but same corner, and nice bike also !!! Coincidentally, I had a small pile of motorcycle travel books at Xmas and Lois's tale of a trip through the Americas on a Serow was one. I found it absolutely excellent - like Ted Simon, she really conveyed the feeling of what it was like and how she felt rather than the gung-ho attitudes of some other travellers. Another book I really enjoyed was One Man Caravan by Robert Fulton - a trip on a Douglas to India in the early 30s. One I wasn't impressed by was India: The Shimmering Dream by Max Reisch. I suspect the difference was partly that the latter was the story of a trip by 2 people rather than one on their own and perhaps because of that there was much less connection with local people. As the author was an Austrian and the book was written in the late 30s there was also more than a whiff of attitudes which I found distasteful. Hi guys. It seems this page has become a "general comments" page. I never thought folks would just want to chat casually - it's great! So I've created a "Chit-Chat" page which can be accessed from the links on the top left. This will allow me to develop code that will hopefully be more suitable in the future. That's probably a bit much even for me Henrik! I do have some curious plans but whether or not they come to fruition is another thing. You fancy doing a bit of desert rallying Henrik? That thing looks damn tall I don't think my feet would touch the floor. It looks very impressive, but then it's hardly standard spec any more. 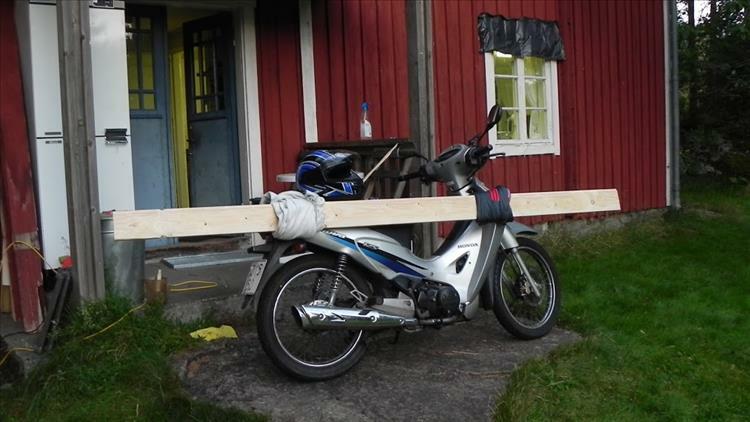 Perhaps I should fully rally prep my CBF125, that could be funny.